Don’t Search for Media, Use the Preview! Thinking how to organize better your media in WordPress, find easily the images already uploaded? WP Media folder will do that for you. You will be able to create folders from the original WordPress media manager. You can have unlimited folder levels and no-one will be lost because it’s exactly like in a desktop file browser. No mess anymore! Use it and enjoy. WP Media folder plugin will transform the WordPress native media manager into a real media classifier. You’ll still continue to use the same interface and won’t lose any existing media. You’ll also be able to make multiple select of existing media and sort them in few clicks. As WP Media folder in fully integrated to WordPress and use native functions like media categories, it will be displayed as fast as the default media manager. All plugins that use WordPress media manager will be able to use WP Media folder. As an example, if your theme includes a portfolio custom post type with images, you’ll be able to find your images and folders or even create a folder “Portfolio” for that! It’s exactly the same with third party plugins. WP Media Folder has an inbuilt gallery function that is fully integrated with the default WordPress gallery manager. You can create gallery from folder or from image selection right from your media manager. 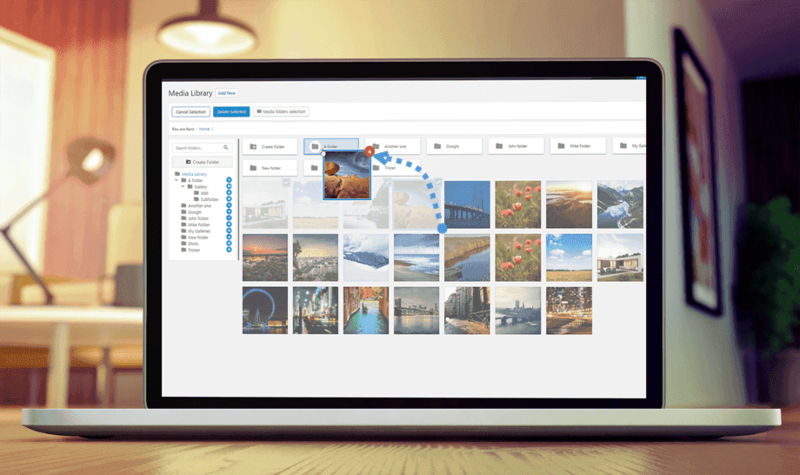 Create a folder, upload images, create a gallery, select theme and options and you’re done! You can place your media in folder and sub-folder, furthermore one media can be in multiple folders and it’s only one clic away! You can also ulso use the WordPress media manager to batch apply multiple folders on multiple media. WP Media Folder allows to apply image watermark on your media, a end-user, non-removable watermark. The watermark can be applied on the whole image library, on a selection of image sizes, or on a selection of folders. Plus you got an option to regenerate all the image from your library to apply the watermark. Watermark feature include an image scaling option. WooCommerce is fully compatible with WP Media Folder. Usually your products images are mixed with your website images. Now you’ll be able to, for example, create a root folder for your product, then subfolders for your products categories and put all your media inside. The full WP Media folder plugin use the same interface as WordPress media manager regarding design and actions. So you’ll be able make image/files multi-select and drag’n drop element into folders. The folder creation is just one click away. Intuitive and fast, font icons and few Kb of JS to make it work. Tired of searching a media in your content and replace it everywhere? now it’s over, select a media, click on replace and voila! You have a security to replace only media of the same type (jpg to jpg, png to png, gif to gif,…) so links to media will remain the same. All the thumbnail are instant regenerated and updated everywhere on your website. You can duplicate any media, any type (image, zip, pdf…). It’s very handy when you want to make some modifications on a media while preserving the original one. Tired of the WordPress media squared crop? WP Media Folder got a preview feature, on mouse hover, a media preview is displayed along its its filename and title. Furthermore, no resource is required because its using a thumbnail already generated by WordPress! Have you ever tried to send files through FTP in WordPress media /uploads folder? Or need to import a massive amount of images from a server folder in the native WordPress media manager? now it’s possible as an option in WP Media folder. Select a folder and/or subfolder, click on import, it’s done! All the folder structure and media are nos available in the native WordPress media manager. Plus we’ve added a sync feature that let you sync any server folder with a WP Media folder, when you want! Since 1.1 version, we’ve now included a folder tree folder to navigate faster into multi-level folders, find you way through multiple folder and upload files inside easily. Indeed, image will be automatically uploaded in the folder where you currently land. Plus you can dragn’drop images or folders inside the tree! WP Media folder adds some actions to your media library using the mouse right click. Manage your media faster media on a full width interface with alternative small layouts combined with advanced media filtering system. WP Media Folder has an option to limit media display and media management to own user media only (or user role only). This is quite useful when you got content editors on your website, to limit access to only their own media, it can avoid some mess. When a new user is created, he’ll have a own root media folder created for him with all his media inside. He can create folders inside of course. As admin you have an option to display/hide your own media right inside the media manager (check the screenshot). You can select alternate WP Media Folder design: on the classic design you’ve got an option to setup any folder image as folder cover. Pretty handy to manage gallery album. On the modern design on the other side you can setup folder colors. Visual composer and DIVI builder users, you’ll be happy because WP Media folder is fully compatible with the plugin. You can select images with WP Media folder for single image block, gallery block and all block that call images. Using another page builder? the plugin has been tested with a lot of plugins like: ACF, Site Origine page builder, Themify builder, Live composer page builder. WP Media folder got an inbuilt tool to regenerate all the WordPress thumbnails. Making a WordPress website migration can generate broken thumbnails, now you can regenerate all from the original images and the tool can handle a very high volume of image generation (unlimited). We don’t play with your media. If you choose to disable or uninstall our plugin, you’ll be back to the original WordPress media manager, all media will remains untouched. 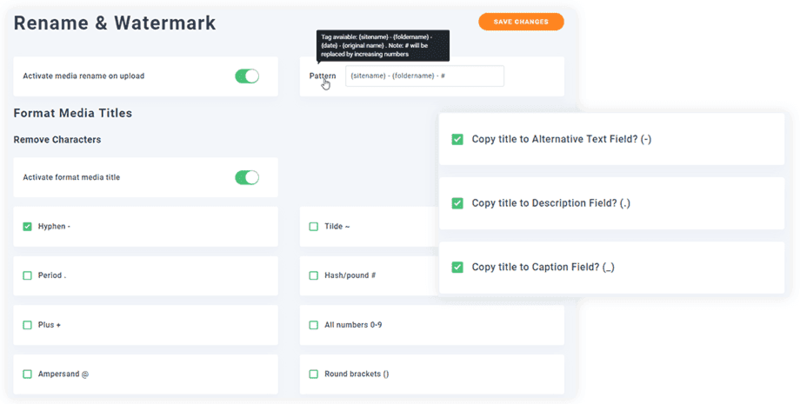 You have an option to rename automatically your media on upload and copy media title in media information, respecting a pattern you’ve defined, which is great for SEO. Furthermore, there’s up to 20 options to remove characters in media titles. Load and manage Youtube, Vimeo and Dailymotion videos among your media, so a remote video can be added, modified, re-used all over your WordPress website. WP Media Folder also handles animated GIF. The WP Media Folder addon brings amazing features to your WordPress media manager. Besides the WP Media folder plugin features you’ll get the possibility to connect and synchronize the WordPress media manager with the Dropbox and Google Drive cloud services. Everything is included in a single plugin addon, plus, a responsive PDF embed feature.